A while back, my mom and I had lunch together at Olive Garden and we both got the soup/salad/bread lunch. This was when I first tried their Zuppa Toscana and I was immediately a huge fan. I couldn’t wait to try making it myself! I found a copycat recipe online that looked easy to lighten up and then I waited all Summer for the weather to cool off so I could make it and post it here for you all. Fall is finally here and so is soup season! I finally made this lightened up Zuppa Toscana (Italian for Tuscan Soup) and it was worth the wait. 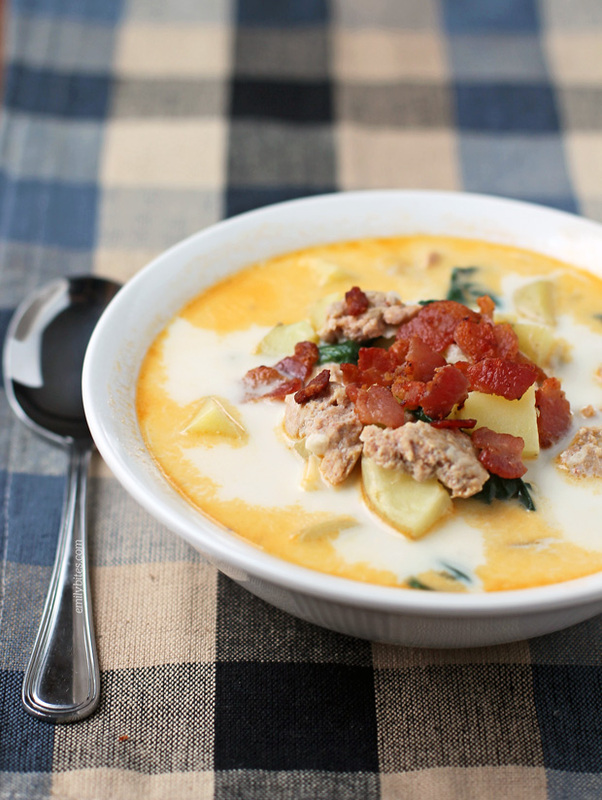 The serving size is huge and filling with hearty potatoes, spicy sausage, spinach, bacon and a creamy broth. You’ll never believe it’s only 236 calories or 5 Weight Watchers SmartPoints! 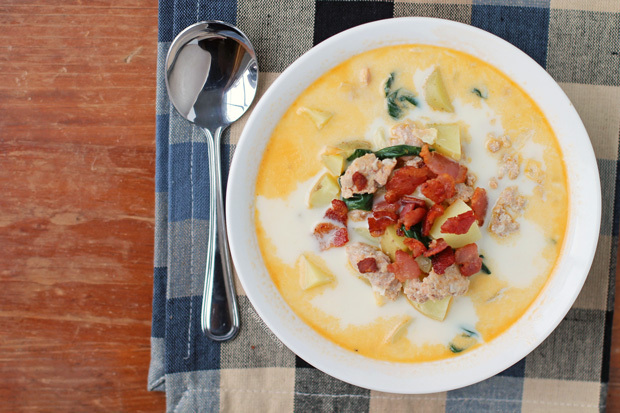 This Zuppa Toscana is quick and easy to make and perfect for those Fall and Winter months when you want something warm and hearty! You can also make this once and bring it for lunches throughout the week! If you’re on a soup kick, be sure to check out my soup category for favorites like Butternut Squash Soup, Creamy Chicken & Wild Rice Soup, Broccoli Cheese Soup, Cheeseburger Soup, Chicken & Dumplings, Spaghetti & Meatball Soup, Chicken Tortilla Soup, Slow Cooker White Bean Soup, Roasted Tomato Basil Soup and more! Bring a skillet over medium heat and add the diced bacon. Cook the bacon until it starts to sizzle and then stir occasionally, continuing to cook it until the bacon pieces are crisp and red/browned. Remove the bacon pieces to a paper towel and dispose of the bacon grease. Bring a stock pot or dutch oven over medium heat and add the sausage. Cook for a few minutes, breaking apart with a wooden spoon until it starts to brown a bit. Once the meat starts to break apart, add the onion and garlic and stir together. Continue to cook while breaking up meat and stirring regularly until sausage is cooked through and onions are softened. Pour the chicken broth into the stock pot and increase heat until broth comes to a boil. Stir in the cubed potatoes and wait for the soup to return to a boil. Reduce the heat back to medium and allow to boil for 10 minutes until the potatoes are cooked. Stir in the baby spinach for 1-2 minutes until wilted. Stir in the half and half and allow to heat through another 1-2 minutes. Add salt and pepper to taste. Serve hot and garnish with the bacon pieces from step 1. I love to make this soup at home (my husband’s fav) but I like to add kale to my soup instead of the spinach. I will have to give this a try! Thanks Emily! I trust you in all things soup! Your butternut squash is my absolute fave. I will be making this one soon…cool weather this weekend. I’ve actually never been to Olive Garden but, once the weather dips below 60 degrees, I NEED soup. And I think I need this one! I LOVE the zuppa toscana at Olive Garden, so I was THRILLED to see a lighter version of the recipe. I made this soup last night and it is delicious! Tastes just like Olive Garden! I highly recommend this recipe – it is very filling/satisfying. Thank you, Emily Bites! We had this soup last night and it was absolutely delicious! I couldn’t believe it was only 6 points for a cup! I had 1 1/2 cups and barely finished it. Instead of seasoning it with salt I used some chicken bouillon cubes. My husband doesn’t like spinach so I made it without spinach but put some in my bowl. I am eating leftovers for lunch right now! Made this Wednesday night (time constraints on Thursdays) for a heat up & go dinner. It was delicious!!! The kids, 8 & 15 both loved it & had seconds. I kept it at the serving sixe & had a salad & I was STUFFED! Thanks for the recipe! I had never tried the soup at Olive Garden, but I made this recipe tonight and it was delicious! Thank you so much for all of your wonderful recipes, Emily! Oops! I made this yesterday…..thought I had the chicken broth and instead I had the vegetable broth!!!! It was good but I think I need to re-make it with the chicken broth so I can compare. Emily, thank you for always posting such wonderful and point-friendly recipes. I made this for the 2nd time since you posted it last night. Made it exactly as the recipe reads and it is perfect! Having it for lunch again today! thanks so much for your blog! I have been cooking up a storm since joining ww a few weeks ago and have lost 15 pounds so far. I have made a ton of your recipes and we have enjoyed them all! This one was no exception. A very filling soup–we were even fighting over who took leftovers for lunch. Hearty and delicious! Keep them coming! Thank you!!!!!! This is super delish and simple. I wasn’t able to find Hot poultry sausage but added a pinch of cayenne to my mild sausage. So full of flavor! Another vote here for kale over spinach! Love this soup! Which ingredients did you use in the recipe builder? As 6 portions I can’t get the smartpointpoints below 8. That being said I can’t find nutrition facts for the turkey sausage without the casings, but still. Help would be appreciated. It was a very delicious recipe. Thanks for sharing. It may be the sausage you’re using, I’m not sure. I used Wegmans Hot Italian Poultry Sausage. You can find the nutrition information for it here: http://www.wegmans.com/webapp/wcs/stores/servlet/ProductDisplay?langId=-1&storeId=10052&catalogId=10002&productId=352525. Hope that helps! Using 5.75 servings (16 oz) of your sausage drops it to 7 smartpoints per serving. Did you use the Wegmans Food You Feel Good About Potatoes, Baby Dutch Yellow (24 oz)? Sorry to be complicated I am just trying to figure out this new smartpoints system and it’s inconsistencies. You’re looking at the cooked weight of the sausage. Four patties is a pound uncooked so it’s four servings of the sausage. I also used Wegmans center cut bacon and I just used a generic value for uncooked potatoes in the recipe builder. Hope that helps. Like with any of my recipes, if you use different brands or ingredients then the nutrition information and points values may be different for you. I just post what they were for me as a guideline, feel free to recalculate using your own ingredients and use those points for yourself. I calculated it through the new program and it totals 7 points per serving, not 5. Not sure where the calculations are getting confused. I have done several of your recipes which are amazing, but they all seem to be a couple points higher when I recalculate them through the new program. I don’t know if you’ll have an answer to this question, but I couldn’t find anything online: we don’t have fat-free half and half in Canada, so I’m wondering how to work around that ingredient. The soup looks really creamy, so it needs something…evaporated unsweetened milk? Puree a bit of potato? What do you think would give the same texture? I answered my own question tonight when I made this soup: it was going to be a staggering 15 points per serving if I used evaporated milk, so I omitted any sort of cream/milk. I found by boiling the potatoes long enough they broke down and made the broth opaque and hearty, if not exactly creamy. Oh, and I added 1/2 cup of white kidney beans just because, and reduced the sausage to 8 ounces to lighten it up further. It was delicious! This soup is great and tastes just like Olive Garden. My husband has requested it again and he’s not even a soup person. Emily, Thank you for all of GREAT recipes that you make and share with us!!!! Had this tonight and it was wonderful! Used mild sausage to keep the kiddos happy. They gobbled it down and said it’s a keeper. Very filling and huge portion for 5 points! Thanks Heather, I’m so happy the whole family loved it! My husband and I just started the Smart points. Your website has been an absolute lifesaver. I made this soup tonight and he said it was literally the best soup he has ever had! Beyond delicious!! This is the first recipe I’ve made for your blog and it did not disappoint. Quite the contrary actually – I want to eat this for every single meal for…well, forever! It’s incredibly delicious. Quick question – on the fat free half & half; if I look that up in the WW app, it’s 9 points for 1.5 cups. And whole milk is 10 pts for 1.5 cups. Without having the fat free half and half in front of me, I’m guessing it’s because of some sugars in there? I’d rather use the whole milk because it feels like a better clean eating ingredient (less additives). Realizing it takes the fat content up, however I’m counting points, not fat grams. Do you think it’s a safe substitution? Thank you. I would love to try this recipe but I don’t think I can find fat free half & half in Toronto Canada so can I used FF sour cream or greek yogurt instead? Thanks for your help and all your great recipes! I made this tonight and it was delicious! !! Will make again ..next time I’m going to add a 1/4 c of instant mashed potatoes to thicken up a bit…didn’t change point value 🙂 thank you!! Hi Jeasica, I’ve never used an Instant Pot before (I don’t own one) so I really can’t say! Hi Jessica, if you use different brands or ingredients you definitely may come up with a different value. Since I can’t see your recipe builder I can’t say specifically why yours would be different but the points I post are based on the brands and ingredients I used. I hope that helps! Looking to make this dairy free. Which milk alternative would you suggest to complement the flavor profile? Thanks in advance! I made this tonight and it was delicious! I definitely plan to make this again! I was confused how you had 6 servings of 1 & 2/3 cups with the ingredients listed in the recipe for a recipe total of 10 cups. I added 3 additional cups of water and ended up with a total of 7.5 – 8 cups. Is there a typo in the recipe?